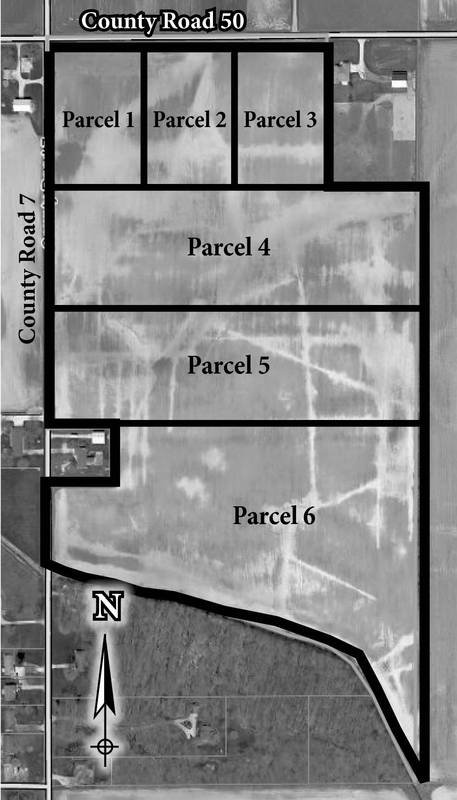 PROPERTY LOCATION: 2 miles north of Nappanee, IN – East of downtown Nappanee, IN 1 mile to CR#7 then north 2 miles. AUCTION LOCATION: Hahn Auction Building – 401 S. Oakland Ave., Nappanee, IN 46550 – East of downtown Nappanee, IN on US 6 (Market St.) to Oakland Ave., then 2 blocks south. 6 varied parcels from 4 acres to 21.3 acres. Unlimited opportunities, fantastic location, immediate possession. These smaller tracts of land are hard to find. Parcels 1, 2 and 3 are all 4 acre tracts with 328' frontage on CR 50 x 536' deep. The land is all tillable with varied sub surface tile in varied locations. Soil Types: All tracts will have tile easements to The Haverstick/Darkwood Ditch for perimeter drains if needed. All the above tracts of land have the same soils and they are Brookston Silt Loam and Crosby Loam. This is very heavy clay type soils and if you want to build a home, a mound septic system will be needed. Any announcements made day of sale take precedence over printed matter.